On appeal of the district court’s dismissal of Visual Memory, LLC’s patent infringement complaint against NVIDIA Corporation, the Federal Circuit concluded that the patent claims are directed to an improved computer memory system and are not directed to an abstract idea of categorical data storage. Visual Memory LLC v. NVIDIA Corp., No. 2016-2254 (Fed. Cir. Aug. 15, 2017). The Federal Circuit reversed the decision from the District of Delaware and remanded the case for further proceedings. Visual Memory’s complaint alleged that NVIDIA’s Quadro and Tesla lines of graphics cards and graphics processing units infringed U.S. Patent No. 5,953,740. The '740 patent is directed to a computer memory system with programmable operational characteristics that can be tailored for use with multiple different types of processors without the accompanying reduction of performance seen in prior art memory systems. 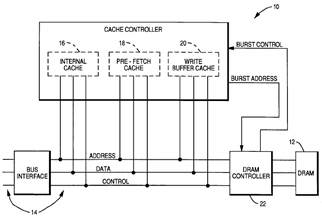 The ’740 patent discloses a main memory 12 and three separate caches: internal cache 16, pre-fetch cache 18, and write buffer cache 20. Col. 3, ll. 34-53. The three caches possess programmable operational characteristics that are programmable based on the type of processor connected to the memory system. When the system is turned on, information about the type of processor is used to self-configure the programmable operational characteristics. By separating the functionality of the caches and defining those functions based on the type of processor, the patented system can “achieve or exceed the performance of a system utilizing a cache many times larger than the cumulative size of the subject caches,” according to the specification of the patent. Col. 4, ll. 24-26. Also according to the specification, using a programmable operational characteristic based on the processor type can also improve the main memory. The ’740 patent’s main memory constitutes an advance over the prior art fast page mode memory because it is divided into pages containing either code or non-code data, and “the system provides a bias towards code pages or non-code pages depending upon the type of processor connected to the system.” Col. 4, ll. 55-58. NVIDIA moved to dismiss the complaint asserting that the claims are directed to patent-ineligible subject matter. In dismissing the complaint, the district court cited to two previous Federal Circuit decisions, Content Extraction & Transmission LLC v. Wells Fargo Bank and In re TLI Communication LLC Patent Litigation, to conclude under step one of the Alice test that the claims were directed to the “abstract idea of categorical data storage,” which humans have practiced for many years. The court’s step-two analysis found no inventive concept because the claimed computer components – a main memory, cache, bus, and processor – were generic and conventional. The ’740 patent’s programmable operational characteristics did not provide the inventive concept, according to the court, because they represent generic concepts that determine the type of data to be stored by the cache, and the patent fails to explain the mechanism for accomplishing the result. In the Federal Circuit’s reversal, the majority opinion found the district court’s reliance on the patent-ineligible claims in Content Extraction & Transmission LLC v. Wells Fargo Bank and In re TLI Communication LLC Patent Litigation, misplaced. Rather, supported by the “guideposts” of its prior decisions in Enfish, LLC v. Microsoft Corp., 822 F.3d 1327 (Fed. Cir. 2016) and Thales Visionix Inc. v. United States, 850 F.3d 1343 (Fed. Cir. 2017), the Federal Circuit found the ’740 patent claims directed to an improved computer memory system, not to the abstract idea of categorical data storage. As with Enfish’s self-referential table and the motion tracking system in Thales, the claims here are directed to a technological improvement: an enhanced computer memory system. Page 10 of the decision. The ’740 patent claims focus on a “specific asserted improvement in computer capabilities” – the use of programmable operational characteristics that are configured based on the type of processor – instead of “on the process that qualifies as an ‘abstract idea’ for which computers are invoked merely as a tool.” Citing Enfish, 822 F.3d at 1336. And like the patents at issue in Enfish and Thales, the specification discusses the advantages offered by the technological improvement. The majority found that “this is not a case where the claims merely recite the ‘use of an abstract mathematical formula on any general purpose computer,’ ‘a purely conventional computer implementation of a mathematical formula,’ or ‘generalized steps to be performed on a computer using conventional computer activity.’” Citing Enfish, 822 F.3d at 1338. The majority concluded that “[c]onfiguring the memory system based on the type of processor connected to the memory system is the improvement in computer technology to which the claims are directed. Alice requires no more from the claims or the specification to support our conclusion that the claims are not directed to an abstract idea. This conclusion is particularly proper on a motion to dismiss under Rule 12(b)(6),….” Because the court concluded that the ’740 patent claims are not directed to an abstract idea, the court did not have to proceed to step two of the Alice test. The dissent argued that the ’740 patent claims are ineligible under § 101, stating that the claims should be treated as directed to the abstract idea of categorical data storage. Further, at step two of Alice, the dissent would find that the claims fail to recite any inventive concepts sufficient to transform themselves into a patent-eligible application. Responding to the dissent, the majority noted that, first, the patent includes a microfiche appendix having what the dissent assumes would not teach one of ordinary skill in the art the “innovative programming effort” required for a computer to configure a programmable operational characteristic of a cache memory based on the type of process connected to the memory system. Second, whether a patent specification teaches an ordinary skilled artisan how to implement the claimed invention presents an enablement issue under Section 112, not an eligibility issue under Section 101. Third, the dissent assumes that the “innovative” effort in the ’740 patent lies in the programming required for a computer to configure a programmable operational characteristic of a cache memory, which is inconsistent with the patent specification. Draft the specification as a problem and a solution; better yet, draft the specification as a technical problem with a technical solution. “Technical” here means something that improves the performance of a computer, e.g., faster processing, less memory, more efficient operation. Include “technical advantages” in the detailed description. This provides support for later assertion that the invention is something more than an abstract idea. This also creates disclosure that can be relied on to overcome Section 103 rejections. Draft claims varying in scope, e.g., a small set of claims including a detailed independent claim reciting the technical features and noted technical advantages, and additional sets of claims that vary in breadth. Visual Memory’s claim 1 barely survived, and only survived because the court borrowed ideas from the dependent claims to justify its decision. Start the claims section with the detailed, descriptive claim mentioned above as claim 1. The PTO guidelines state that the broadest claim should be numbered as claim 1. Be sure that the claimed invention is fully enabled to satisfy the requirements of Section 112. Note that it is probably not necessary to go back to submitting computer code on microfiche (the ’740 patent was filed October 5, 1995 with a 1990 priority date; a microfiche appendix was common practice at that time). While currently pending applications were possibly written several years ago, try to find in the specification the sorts of technical benefits that the court here is relying on. Examples of such benefits could include problems with the prior art that the invention solves, or new features that the invention adds. These benefits should be “technical” in nature, i.e., having a positive effect on the computer’s performance. They, preferably, are disclosed in the specification. This appeal is from a motion to dismiss for failure to state a claim pursuant to Federal Rule of Civil Procedure 12(b)(6), where all factual inferences drawn from the specification must be weighed in favor of Visual Memory, the non-moving party.